Health services and disability prevention, treatment and medical rehabilitation (made in diagnosing and treatment required). 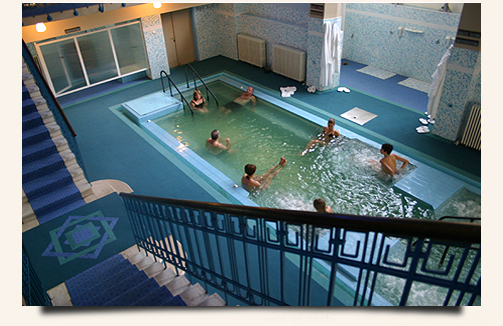 kreno therapy (drinking all mineral and mineral water: "Hot Water", "Lake", "Snežnik" and "Slatina"), swimming in thermal mineral water in tubs and swimming pools, thermal mineral water inhalations, thermal mineral water enemas, vaginal and sprinkling / or flushing of thermal mineral water. Views specialists (in the diagnosis and follow-up diagnosis of the urologist, physiatrist, neuropsychiatrist, gynecologists, ophthalmologists, internists, sports medicine, pediatric). Views subspecialists (if necessary, gastroenterologists, endocrinologists and cardiologists). Physical therapy: ultrasound therapy, electrotherapy (dijadinamičke current, interferential current, laser therapy, TENS, magnetic therapy, KTD), hydro-therapy (underwater massage), paraffin therapy, kinesis therapy. The prescription drug therapy (medication purchases and pay only person who uses the service), as prescribed by the doctor, taking the prescribed manner appropriate medical records. Medical control physician (24 hours during their stay in stationary users). In the event of deteriorating health, the need for urgent surgical intervention or another, medical corps transportation to health centers in Kraljevo. Compile lists of discharge epikrizom. half board (breakfast and dinner classic usluženje) as needed and recommended by doctors introduction of brunch. Nutrition as needed and can be recommended by doctors and diet. - Guests in the house, "Mercury," a new and "Šumadija Lux" entrance to Aqua Centre "Waterfall"
Free (230 m2 swimming pool with a diameter of 17 m with thermal mineral water temperature 27 ° C with a cannon for an underwater massage, virpul for 12 people, a geyser, badi -jet, waterfalls). - Guests in the house, "Mercury," a new and "Šumadija Lux"
entrance to the fitness center, "Mercury - Gym" is free - Sauna park, tepidarijumi (hot stone benches), fitness room (treadmills, Crosstrainer, bikes, paddles dry, gladiator as well as equipment for special applications). Discover the secrets of unspoiled nature .... Change lifestyle and prolagodite the new trends that are constantly changing ... Dedicate yourself to you, your ideas, your dreams, your body and spirit ... Ulepšajte your life and create a special and very pleasant experience. Wellness Center "Fons Romanus" ... pleasant and relaxing, filled with positive energy and peace, the ambience, which illuminates the warmth. With music, light candles, the scent of aromatic oils, give yourself the experience of perfect relaxation, restore vital energy and the balancing of body and spirit. .. Swimming pool with thermal mineral water with underwater massage, Royal and Queen's bath, Turkish bath and sauna park, and Hot Stone massage, Choco - Mint Treatment ... are just some of the wellness services that will make your life more comfortable, healthier and more beautiful. A wide range of treatments and massage is performed with the use of natural products that blend with your skin and cause only the hands because it is the heat they touch carries the most beautiful thing we can feel. Swimming pool with thermal mineral water and exclusive rooms for therapies and treatments healing mud-mud in combination with a mineral bath, bath in the Royal bath, underwater massage, hand massage, Anti-cellulite massages as well as a large number of peloidnih package on a standard or Velvet bed with a medical professional. Step into the Aqua Center, the place of enjoyment and harmony. Only a relaxed mind is a creative, relaxed body effectively, because regain energy, refresh and discover new pleasures with the contents of Aqua Centre "Water Fall". Swimming pool with thermal mineral water, virpulom, guns for underwater massage, badi - jet, geyser and Fitness Center "Mercury Gym", sauna park, tepidarijumi will give you relaxation, relieve your stress and take you into the world of pleasure. Mercury Aqua Center offers the opportunity to pool with thermal mineral water (30C), which forms a natural set of elements necessary for your health, heat , pleasure and relaxation, sophisticated feel the really healthy mineral water. Guests of the "Mercury" and have a chance in bathrobe and slippers, from room to enter into this fairy-tale world of water in it reveal how to listen to your body, spirit dozvele own energy to flow freely . Fitness center, sauna park, Knajpov shower and tepidarijumi the place of entertainment, relaxation and zadovoljasta the most demanding guests. Fitness center "Mercury-Gym" has the latest equipment from cardio program, treadmill, Crosstrainer, room bisikle, Tvister, dry oars, the popular "Gladiator" as well as equipment for special programs under the supervision of fitness instructors.